Barrel Dynamics | A Division of Drilling Dynamics - providing gun barrels at a fraction of the cost. 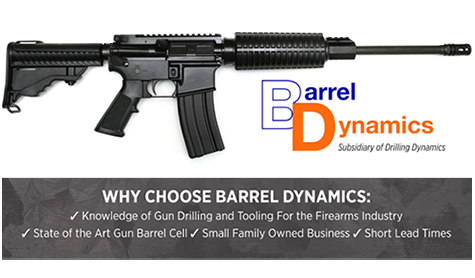 Barrel Dynamics has the Experience, technique and tooling through 30+ years of gun drilling experience. Due to our state of the art barrel cell and strict quality control we at Barrel Dynamics firmly believe that our barrels will be the closest to match grade if not match grade barrel that you will ever purchase at a fraction of the cost of a match grade barrel. We manufacture quality barrel blanks and finished barrels for the firearms industry. Barrels will be offered in a variety of materials such as 416 stainless, 4140 and 4150 steel etc. and a variety of sizes including but not limited to .140, .170, .223, .300, .450 and many more. Quality button rifled gun barrels at a great price! This is the final stage of our barrel making process, which is inspection. In this picture we are air gauging the barrels to confirm that our rifle and bore size are within specifications. We then visually inspect the barrels via a bore scope to ensure that there are no defects, cosmetic or otherwise that may affect the barrels accuracy when fired. Barrels are inspected both before and after stress relief.